We were only in the port city a few hours when it was clear: we'd select Barcelona if we needed to quickly choose a European city in which to live. This was our 3rd, maybe 4th, visit to Barcelona and it was a 'business' trip instead of a sightseeing visit but one can't not sightsee in Barcelona. Debarking from the back of the boat at Barcelona. 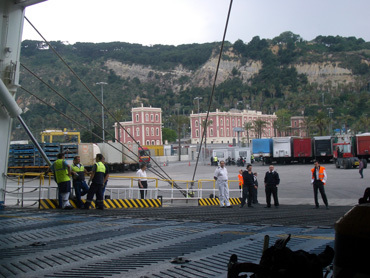 We arrived by ship from Genoa after 2 months in Sicily and were running for cover from a downpour before we left the port. But even amidst the showers and oppressive noise and fumes from the truck-trailer rigs off-loading from the ships, Barcelona was captivating. Moments after turning out of the port grounds onto the main drag we were on a bike lane. "Bike lane!" how civilized, how welcoming, how pleasant. We were on a broad promenade the width of several car lanes together with the pedestrians and safely away from traffic so we could stare at the wonders of the city instead of scramble for our lives. La Rambla, the ultimate in pedestrian promenades, cuts a lovely swathe through the heart of the old city and intersected with our port promenade at a round-about. This intersection was a stately traffic circle with a grand central column dedicated to Columbus and stunning historic buildings on the open corners. No doubt arriving from rough and tumble Sicily amplified the experience, but we were in awe even though we weren't seeing it for the first time. If we had been in a hurry to bike the many miles through the city to our suburban hotel the day we arrived, we soon forgot it. We happily walked our bikes through the crowds on La Rambla and stopped often to stare at the many visual delights including the beautiful facades, the top rate street performers, and many flower shops. I loved being bathed in the lively energy of the easy-going crowds leisurely enjoying themselves and didn't want to leave it behind. It was wonderful to see beautiful architecture in broad, well-maintained public spaces in Barcelona. An ease washed over our beings, something we never experienced on the streets in Sicily's comparable port city, Palermo. We were struck by the civility and sophistication of Barcelona, like that of many proud northern-European cities, but appreciated how it was balanced with the ease of the Mediterranean culture. You never know what you'll see when you look up in Barcelona. Our last 3 months had been spent in Tunisia and Sicily and in both of those lands things like museums and public spaces looked like they were 'done to them' by outsiders. Those cultural extras were there, but for the most part they often appeared to never have been done well and weren't maintained. In contrast, Barcelona, like many of its more northern neighbors, looked like it had nice public spaces because the people wanted them, they valued them once they got them, and they took care of them. It's like the people of Barcelona had an abundance of energy and goodwill that spilled over into the public sphere rather than having too little of their own to feel generous as seemed to be the case in Sicily. Coming from Sicily, we were stunned at Barcelona's public spaces, both in the urban center and in our hotel's suburban neighborhood of Cornellà de Llobregat. The public spaces were quite literal: they were public and spacious. We occasionally found a lush and lovely city park in Sicily but they were often fenced off and locked up despite having signs saying they were public property. When we looked for a picnic spot or a place to pause in Sicily, we'd often settle for a 'one bencher' on a street corner or sat on a retaining wall. But Barcelona had broad walkways, promenades, and sitting areas and unlike Sicily, almost always some seating in the shade. Deeply shaded areas, dog parks, playgrounds, skateboard parks, and pedestrian areas generous enough for the kids to learn to ride their bikes were never far from sight in Barcelona. In contrast, I remember chatting with a young mother in Noto, Sicily who was posted at the end of an alleyway to watch for cars as her 2 kids took turns learning to ride their 1 bike on rough cobblestones. 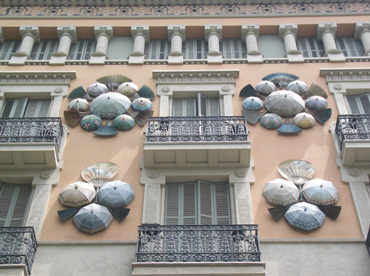 The abundance in Barcelona showed in the public display of art too. Not having the beejesus bombed out of it during the world wars certainly has given the city an edge and being the hotbed for the Modernista architectural style set a high standard. But Barcelona has kept it up and it is filled with bold public art everywhere we looked and, refreshingly, little of it was religiously themed. My private joke is that the "m" needed for the word 'maintenance' got used up as the "m" in Mediterranean and that's why we see so little evidence of maintenance in the region as a whole, but that wasn't the case in Barcelona. In our first hours in Barcelona we considered seeing a public works man painting a park bench as a tourist attraction--quite a novelty in the context of Sicily. Likewise, we were shocked to be dodging the spray from the power washer cleaning of the exterior of a recycling bin--in southern Italy a more common practice for freshening them up is for citizens to set them afire. The absence of litter was startling too. Everywhere we looked in Barcelona's public spaces we saw things that were clean and well kept. Many of the 50 bikes in these 2 racks were in use. The public art in Barcelona is a class act, but so are the smooth, asphalt strips creating wheelchair routes over the rough cobblestones on the port promenade. We followed the wheelchair route for miles as it meticulously provided bypasses to rough or steep areas--now that's thoughtful commitment to the broader community. Since we were last in Barcelona in 2005 the city had gone bike crazy. Bike paths, bike lanes, and cute rental bikes for its citizens were everywhere. For a mere 24€ a year (about $36 in 2008) Barcelonans can pick-up one of the nifty rental bikes and return it to another rack somewhere in town. The racks we saw held about 25 bikes and in some areas they'd have 2 racks. It was hard to find a full rack to photo as so many bikes were always in use. When out walking in the city core we'd slow to admire yet another rack of bikes and invariably in those brief moments someone would be dropping off or picking up a bike. When we sat to eat lunch in Barcelona's green spaces, dozens of the distinctively painted bikes would zoom past us. I longed to ride one just be to a part of the frenzy even though we had our own bikes. From brief conversations with folks in the area, it sounds like the year-old program is as wildly successful as it looks. The manner of the people in Barcelona was refreshingly different from those in southern-most Italy though it was hard to put words to those feelings. Compared to the average person we saw in Sicily, the affect of the people on the streets in Barcelona looked so familiar, so normal, and they generally looked at ease and confident. There was a pleasant gentleness and expansiveness about them. They were comfortably ordinary looking people doing ordinary things like walking dogs and playing with their kids. I'd forgotten about walking dogs as that's the kind of ordinary activity we didn't see while in Sicily. When I'd look at an individual on the streets of Barcelona I could imagine that like mine, their life history was pretty uneventful. Theirs would be a story of a predictable middle class life with the usual ups and downs and joys and disappointments. In contrast, when I'd look at a person on the street in Sicily I could imagine that their story would be wildly different than mine. It would be a story of hardships endured. It would be a story of being disadvantaged; of being restrained by the limited resources or confining attitudes; of making do; of only ever getting by, never of getting ahead. It would be a story of what wasn't, not what was--even if it wasn't told that way. 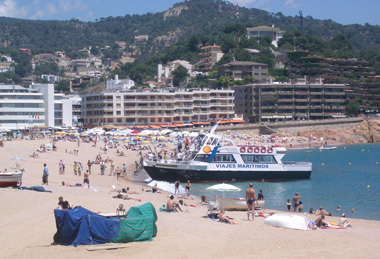 Parts of Costa Brava can accommodate huge crowds. We watched our tempo slow and slow some more as we pedaled north out of mesmerizing Barcelona along the Costa Brava towards the French border. The slowing was for good reason as this stretch of the Mediterranean coast is stunning. 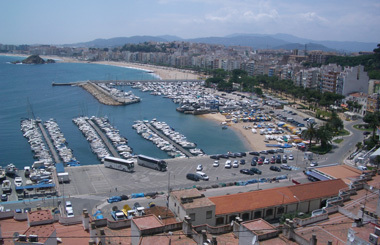 Even suburban Barcelona had beautiful beaches with attractive park-like settings and free showers and dressing rooms that made me reconsider becoming a beachgoer. 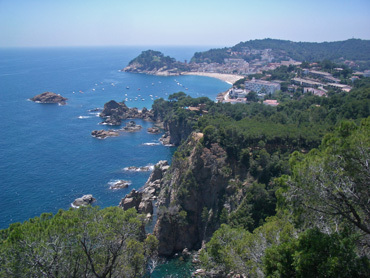 Understandably, this whole coast is wildly popular with tourists from all over Europe and beyond. On some resort town streets you'd think German was the second language in Spain for all the German-speaking tourists. On the roads the French, Dutch, and German license plates seemed to out number the Spanish cars at times. Even water taxis serviced the hotel beaches. Instead of cranking miles on the flat, through Costa Brava roads, we meandered along the broad beach promenades that welcomed bikes and searched for the occasional gritty bike paths linking some of the beach towns. A report of our miles ridden per day and miles per hour would have suggested we were sweating it out on the steep mountain grades but instead we were burning up the time with a lolling riding style that matched the energy level of the adjacent beach scenes. Oh there was a persistent headwind, but we knew that wasn't the problem this time. In the evenings we'd look at the threatening weather reports on TV and hope it would rain in the morning so we'd have an excuse for a layover day. We'd had a string of non-riding days as we ferried from Palermo to Barcelona and while I recovered from a bad case of the trots in Barcelona, so what we really needed were reconditioning days. Our longing for a layover came from the infectious laziness of the resort areas and not from deep fatigue. Looking at our contentment with slowly cruising the beaches and at the thousands of people around us that were barely moving, we again pondered the inherent laziness in most of us. I'm more of a 'do-er' and less of a 'sitter' than Bill, but even I have my lazy side, that part of me that would rather be idle than move. Bill diplomatically pointed out that the tugs of laziness that were especially strong on the Costa Brave weren't character flaws but a reflection of our biological programming. As he said, for essentially the entire history of Homo sapiens sapiens and the 3 million year existence of our predecessor species, conserving energy was a critical survival instinct. For humans and most other species, the struggle for life has usually meant the struggle to get enough to eat. That survival struggle had 2 main strategies: eat more and move less. The trick was always to move just enough to feed oneself but not to expend more calories procuring food that was gained from the food obtained. A reminder of less abundant times on Costa Brava. For a week we stared at the beautiful coast line as we threaded our way through the crowds of people in survival mode: people slowly moving between meals at their hotel's buffet line to the beach and back. Needless to say, many of the people who were drawn to this relaxing vacation environment were substantially overweight. The holiday lifestyle indeed was perfect fit for the American standard of an ideal vacation: a time to relax and to be released from the normal daily pressures of life. While being immersed in the beach scene and spending a night at one of the beachside hotels and visiting its all-you-can-eat buffet line, it was interesting for us to once again ponder how much things have changed for humans, especially in the West. We were reminded that most Westerners are living in an age of abundance and that our survival mode programming is now self-destructive. Food availability in our Western world has changed at a pace that has far outstripped the recalibrating ability of our biological programming. We are programmed to dive-in at the buffet line and then sleep it off so we can stash the excess calories as stored fat for the lean times, but the lean times have stopped coming. Looking back at the water taxi beach from the hills. As the pancake flat coastal roads became steep and the beaches with their crowds became specks in the distance, I thanked all of those vacationers for the new clarity they'd helped me achieve: that despite the outdated wisdom of our biological programming and the consensus validation going on in those crowds of people that we'd jostled with, fighting the tug of energy conservation and instead tackling the steep hills was the right physiological response in our era of plenty. I was grateful for the indirect pep-talk delivered during our cruise along the beaches--a visual lecture that reminded me to resist the obsolete instincts and instead get out there and recklessly burn those calories our predecessors couldn't afford to squander. 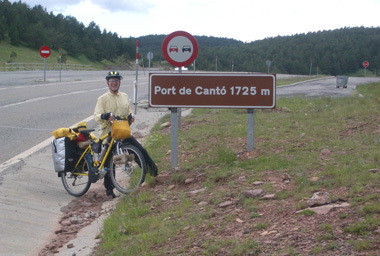 In addition to enjoying the lovely scenery, our ride north along the Costa Brava stretch of the Mediterranean was selected by Bill to position us for tackling the Pyrenees from their northeastern end. 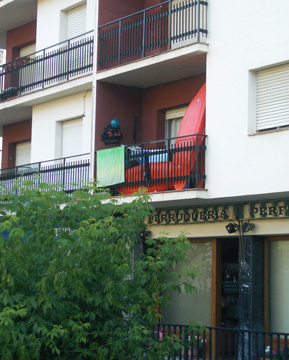 He had searched the book stores in Barcelona for Pyrenees hiking and biking information with little success so we'd planned to try again in the French city of Perpignan at the base of the mountains. But we were surprised to walk way empty handed there too and he was left to nervously figure out the route on the fly rather than confidently follow one of his crafted plans. Perpignan delivered several disappointments, another of which was our harsh reception. Each time we enter France I try hard to set aside my biases formed by prior unpleasantness in France, but it was amazing how quickly those biases were reinforced. 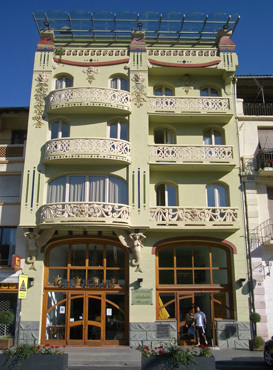 The second night in France we arrived at our Perpignan hotel to be told "You made a mistake when you made the reservation"--the hotel was fully booked and we were without a room. We were on the books for 10 days later and knew it wasn't our error as I had listened very carefully when Bill made the reservation--in English. But there had been no middle ground in the French perspective: the reservation was wrong so it was our mistake. The next morning we were again extremely disappointed, this time it was in discovering that the French telecom industry was behind the European trend of making cell phone service cheap and easy to obtain. In most of Europe we can get a SIM card to slip into our phone and a package of minutes for $8-12 but in France the start-up was closer to $50 or much more. The pricing difference was evident on the streets as in Italy and much of Europe, cell phone service is so cheap and therefore heavily used that mobile phones appear to be an appendage on most people. In Sicily, seemingly every 10 year old had a phone in their hand and half were talking on them. In Perpignan, a scan of a cluster of people would instead reveal at most 1 or 2 using their cell phone. Internet service for a laptop via cell phone was a service we'd affordably used this year in Tunisia and Italy but was not yet available to us in France--at any price. After enjoying the gentleness of the people during our brief time in Spain and the very pedestrian friendly attitude there, we were disappointed to be taking our lives in our hands to cross the streets in Perpignan. And despite the Tour de France and the country's strong bike racing tradition, most French auto drivers consider it the cyclist's responsibility to survive the motorists. One motorcycle was close enough for me to feel the exhaust stream on my leg as he passed with no oncoming traffic. That was quite the contrast to Italy where an overtaking driver is happy to make it the oncoming car's problem while passing bikes with a wide margin and to the very cautious Spanish drivers who wouldn't overtake us until the coast was completely clear. On the plus side, I was grateful at a Perpignan pharmacy to be allowed take the time to choose my sunscreen and buy the one I preferred. We've repeatedly been stunned in Italy and Germany at how difficult that seemingly simple chore can be. We buy a high SPF, hypo-allergenic sunscreen that is designed for children as the children's product seems to be more sweat resistant but that appalls German and Italian clerks. They will take the product out of my hand and substitute an adult formulation when they learn it will be used on adults. But in France there was no discussion, I could have what I wanted. 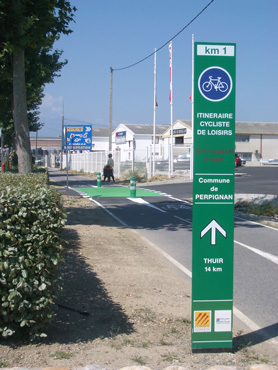 The French intercity bike route was well-marked. We were also impressed with the evolving system of bike lanes in this most southern segment of France. The government is pouring piles of money into bike lanes along the coastal areas, especially around the beaches. 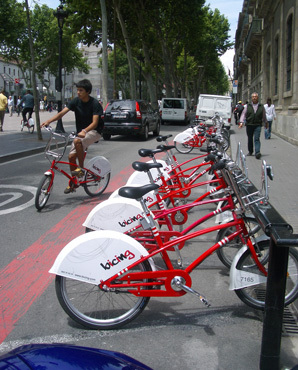 And in 2008, Perpignan initiated its city bike rental program that is clearly patterned after the same model as Barcelona's. Perpignan is using the same bikes and has the same 24€ annual fee as Barcelona. Unfortunately Perpignan also charges if you use the bike for more than 30 minutes and seems to lack the critical mass of bikes. Perpignan has 10 bike stations in the city of about 110,000 and a total of 150 bikes but during our 2 night stay there, we didn't see a single bike in use. In contrast, in much larger Barcelona, we constantly saw the rental bikes whizzing by. Hopefully Perpignan's program will yet take off. Also surprising in this south central corner of France was the Catalan influence--something we thought was confined to northeastern Spain. But the same Catalan of the Barcelona area of Spain is the official second language for parts of France and the same yellow and red striped Catalan flag hangs from government buildings in France as it does in Spain. We huffed and puffed our way up our first Pyrenees pass, the Col d'Ares, and didn't realize that in the process we'd followed an historic path. It was at the summit on the French-Spanish border where we saw the information board and memorial stele. Usually if we find ourselves on an historic route in Europe it is a Roman road or salt route, but not this time. This was the modern-era Camí de la Retirada which we'd seen reference to on the last French beach we'd pedaled along before we turned inland. About all that's left of the Cami de la Retirada. The Camí de la Retirada was the path traveled in January and February of 1939 during the exodus of about a half million Spaniards from Spain to France--civilians and soldiers who were on the losing side at the end of the Spanish Civil War. 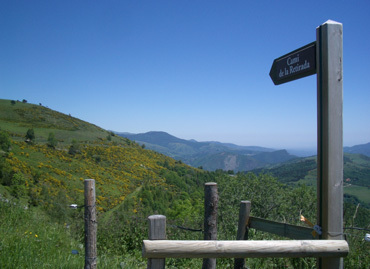 The Camí de la Retirada that we unknowingly crisscrossed was one of the routes across the Pyrenees. The first memorial plaque we'd seen to this event was at the end of the expansive and tranquil beach promenade of Argelès sur Mer, France. That plaque marked the site of the internment camps where about 100,000 Spaniards were crammed into fenced areas on the beach for too long. We knew nothing of the story when we read the beach plaque and were intrigued to learn a little more at the summit. It was a story we wished to know more about though only in this area was this piece of history accessible--the story was too small for mention in what we found to read about the war. We sailed down from the Col contemplating the historic retreat road and cruised into the unexpectedly handsome stone village of Camprodon, Spain where we decided to stop for the night. Bill had planned for us to go farther that day but we decided to quit while we were ahead. The 2500' climb was about what Bill predicted but the "double up arrows" shown on the map were less predictable and turned out to be a series of long 10% grades which were depleting. Lots of stops to rest, especially when the steep grades were in the direct sun, got us through the hard work in good shape but we decided not to press on. We'd lost both the heat acclimation and climbing conditioning that we'd struggled to build in Sicily and knew we'd have to start over on both. And that hot afternoon sun made it easy to decide to be satisfied with the day as a good training ride and hang it up early. Camprodon was in the midst of a 4 day celebration to their patron saint and we arrived as they were packing up for siesta. But even the waning bits of the lively energy in the fascinating town were welcoming--a town that looked like it had recently been 'discovered' from the handsome rough stone 'refugio'-styled condos. Interestingly, the crumbling old architecture suggested that it had always been a town of significance though all we could learn of its history was that it was the birthplace of a famous Spanish pianist. building when he passed through Sort in WWII. 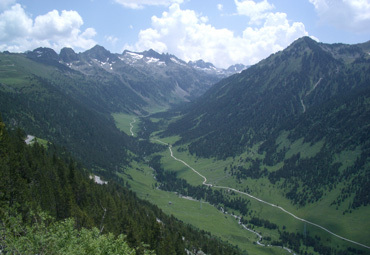 Just days after learning of the Camí de la Retirada in France, one of the cross-Pyrenees routes the Spanish used to escape advancing Franco forces at the end of the Spanish Civil War, we were learning of a similar mountain route used by the French to flee to Spain during WWII only a few years later. The translations were a bit rough, but it seems that once the Nazi's controlled France at the beginning of WWII, 60,000 refugees crossed from France into Spain, many who continued on to Free France in North Africa. The Pyrenees are covered by snow 8 months of the year and the Nazi's tightly controlled the easiest routes through the mountains so routes through places like Sort were "Plan B". Apparently Franco's policy towards refugees was most lenient at the early and late stages of WWII with many refugees at least temporarily being housed in a tiny prison in the village of Sort. Chuck Yeager, the US pilot to first break the sound barrier in 1947, was shot down over Vichy France in 1944 and was helped into Spain by the French underground. He like many refugees was funneled through Sort, a Pyrenees village we stayed in. For reasons unknown to us, Franco's forces were particularly accommodating to Allied pilots and Yeager and other pilots were allowed safe passage through the country to rejoin their forces. Outdoor sports are the visible story in Sort today. It was amazing to us that this sense of community prevailed and the Pyrenees Spaniards generously received the French refugees despite the poverty and starvation they had been experiencing since the Civil War. About half of the Spanish guides that helped French refugees through the mountains were killed because of their participation and many of the French died making the difficult journey. We knew that these 2 chance stories of massive retreats were the tip of the iceberg for much bigger stories. We longed to delve deeper but there was little more we could squeeze out of our scant resources at the time. We detoured to 2 more tiny mountain museums in hopes of finding some trophy tidbits but neither added to our understanding. We'd have to settle for the eager excitement of learning about these little-told stories and hope to stumble on to more chapters in the future. 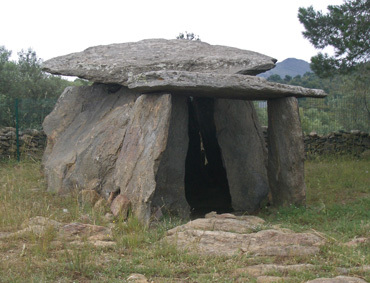 But even the little pieces we'd learned added a welcome depth to our experience of the Pyrenees and had us looking at those mountain surfaces with the mid-century history mind. After the pass Port del la Bonaigua, it was down into this valley. During these first weeks in the Pyrenees we rode over 5 mountain passes, starting with Col d'Ares that was on the French-Spanish border and finishing with Col du Portillon that delivered us from Spain back into France. In between we crested 3 others: Collada de Toses, Collada del Cantó, and Port de la Bonaigua. 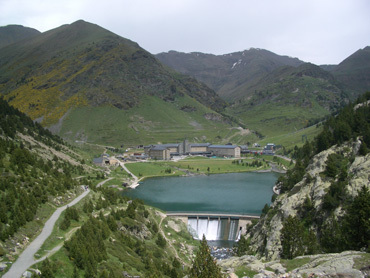 You can get the gritty details about the grades, gains, and road conditions on our Pyrenees-Spain (or France) file under Country Details. (Pyrenees-Spain) It is there that I wrote a daily diary from a cycling and hiking perspective that covers our entire journey through the Pyrenees. The lesson learned on the first pass served us well for the more than dozen passes we crested in the Pyrenees, with the most important early observation being that they are steep. We weren't doing 15-20% grades that Bill skillfully navigates us around where ever we go but 10% grades were a part of the daily diet in the Pyrenees as well as long, sustained grades in the 8-10% range. Our bikes and gear have a combined weight of over 100 lbs and we feel every smidgen of grade with that load. And at grades like that, even variations in the roughness of the asphalt affect our speed and level of effort. We weren't in peak condition when we hit the Pyrenees and we quickly decided that a relative-rest day was needed after every pass. That meant either an easy riding day or a hiking day the next day. Had we not taken those days off and just kept riding, we would have been doing a pass every day as they are tightly packed. It turned out to be a rewarding rhythm and our conditioning peaked as we approached the most notorious pass we'd be doing later on, Col du Tourmalet. We zeroed in on the Pyrenees of western Europe in search of stunning mountains in which to hike and bike; we hoped to find a new area that matched the delightful Italian Dolomites at the eastern end of the Alps. But it wasn't until the day we rode into Sort, after more than a week in the Pyrenees, that we really felt like we were in the mountains. The narrow valley with steep sides, the river rapids running through town, and the ski-village feel of town made it feel like being in the mountains but we still weren't dazzled. No hiking route signs, views, or crowds at most Pyrenees passes. The few sparsely scattered, timeless-looking villages of rough stone along the way reflected the mountain lifestyle but these villages had been snuggled into a mostly rounded-mountainscape, diminishing the impact of the elevation. And like at home, much of the land was covered by trees. Trees are lovely, but instead of land carpeted by trees, we wanted to see craggy rocks and sheer cliffs--we wanted to feel dwarfed by nature. Instead of feeling like an adventure in the mountains, so far riding in the Pyrenees felt like a difficult commute. Curiously, the "pass culture" that we've come to expect and always enjoy in the Dolomites didn't exist in the Pyrenees. Dolomite passes have a long tradition as tourist destinations and are convergence points for people arriving in RV's, cars, motorcycles, bicycles, or on foot. Regardless of how they get there, most everyone is visibly moved by the experience of the grand panoramas and stunning views in the Dolomites. The converging Dolomite pass visitors linger for a meal or drink at the ever-present outdoor cafe at the summit and grab souvenir postcards or medallions for their walking sticks or hats. Multiple signposts in a number of directions guide the visitor who wants to take a short walk on an easy trail or hikers on long distance routes in these Italian Alps. In contrast, in the Pyrenees there were few people at the passes. A pass elevation sign and a garbage can were often all that greeted us after hours of pedaling to reach the top. And of course the people and services weren't at the top because there was nothing special to see: one was merely at the pivot point of the steep hill: you had been going mostly up; now you were going mostly down. Núria: a pretty but not stunning hiking venue. And up to this point the Pyrenees hiking opportunities had been disappointing too. On our relative rest days we had done several hikes from our overnight villages like we do in the Dolomites. But instead of being on exciting mountain trails with grand panoramas, we found ourselves navigating muddy cow pastures. An exception was just after Camprodon where we detoured to be take a special mountain train to a ski lodge that gave us access to the higher elevation hiking area at Núria. This was definitely a higher-rate experience that got us out of the soggy hillside pastures but it still lacked the stunning panoramas we expected. About half way through the Pyrenees we were yet to be impressed. The Pyrenees were pretty, the journey was pleasant, but the sights weren't dazzling. But we'd press on and see the western end of the range hoping the Pyrenees would become more competitive with the Dolomites. We've just settled into our tourist apartment for 2 weeks and are grinning from ear to ear. Even if the pleasant weather turns foul we know we'll have a wonderful time here. And after scrutinizing the Pyrenees for over a month and then the French Alps for a few days, it only took moments back in the Dolomites to vividly experience how different they are--and we love the difference. We'll likely do little or no biking while here and instead focus on hiking up the steep valley walls to revel in the grand panoramas that keep us coming back. We do have our distractions however. As Bill was unloading his first pannier in the apartment building garage he discovered that the pannier mounting bracket was badly shattered. Inspection of his other pannier revealed an earlier stage of similar demise on it even though they are only 6 months old. The new design on the Vaude panniers doesn't appear to be up to the extra load Bill has been carrying. And darn it anyway, that lovely new laptop that Bill has spent hundreds of hours molding to meet our needs is threatening to be nothing but dead weight in an overloaded pannier. Both of these problems are conspiring to trim our first hikes to a couple of hours instead of full day outings but it will take more than these hassles to dampen our spirits. If the weather continues to be pleasant when our time at the apartment is up, we'll linger in the Dolomites a few weeks longer and then head south through Croatia to avoid the chill of fall. Bill hasn't decided where we'll end our touring year but we'll be back in the States in early December.